This is a copy of the full map produced from data gathered in the 1911 Survey. Click the map to enlarge it. Click on a marker to display more information about the station. Orange markers indicate stations with high resolution digitized historic and modern imagery. Purple markers indicate stations with high resolution digitized imagery - no yet repeated. Blue markers indicate known stations, but with as yet no digitized imagery - the images exist only on glass negatives. Dense Coniferous Forest. Greater than 60% coniferous forest cover. Open Coniferous Forest. Between 15% to 60% of the area is coniferous forest. Mixed Wood. Trees cover a minimum of 10% of the area, but neither coniferous nor broadleaf trees account for 75% or more of the total trees. Regenerating Area. Land with evidence of recent burning. Fire boundaries clearly identified or clear sign of recent timber harvesting. Shrubs. More than 10% of the area is vegetated, less than 10% of the area is treed, and shrubs must constitute 1/3 or more of the total vegetation cover. Herbaceous. More than 5% of the area is vegetated, less than 10% of the area is treed, less than 20% is shrub, and herbs must constitute 1/3 or more of the total vegetation cover. Barren Ground. Bedrock or fragmented rock broken away from bedrock surfaces. Exposed soil where vegetation cover is less than 5%. Glacier. Perennial snow and ice with definite lateral limits, typically flowing in a particular direction. Snow Cover. Snow or ice that is not part of a glacier, but is found during summer months on the landscape. Wetland. 'Wet' or 'aquatic moisture regime. The water table is at or near the surface, or which is saturated enough to promote wetland or aquatic processes. Water. A static body of water. an artificial basin of water (e.g. dam, dyke etc), a river/stream with definable banks. Gravel bars are part of a stream while islands within a stream that have definable banks are not. Infrastructure. Cities, towns, villages, hamlets, ribbon development, rural recreation (e.g. rural stores and isolated housing, sub-divisions, cottages, rural residential, acreage owners), transportation, industry. 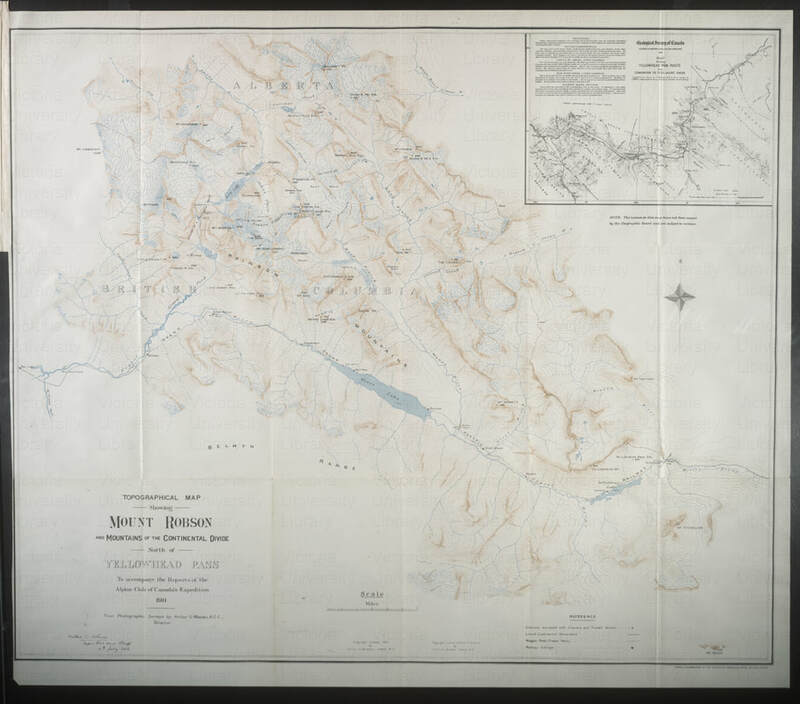 The Vegetation Resources Inventory (VRI) using the B.C. Land Cover Classification Scheme (Version 1.3, 2002), along with Remote sensing and forest inventory for wildlife habitat assessment (McDermid et. al. 2009) were used to create the classification categories. Some condensing of VRI categories occurs in this study because oblique-photographs are used (photos taken from a high point looking out across the landscape at an oblique angle). The VRI does have finer grained category stages but they require othographic imagery (images taken from a high altitude looking down at 90 degrees) in order to be useful. Identification of the historic and modern images in a given pair. An interactive map showing the view in the Mt. Robson area from a given station. A link to the historic and modern image pair in the explore.mountainlegacy.ca website. A link to all of the historic and modern images available from that station. The historic and modern image pair(s) selected for analysis. The historic and modern image pair(s) segmented into vegetation and land use categories. Links to pairwise image analysis comparisons available via the Image Analysis Tool (IAT). Percentage representations of each category in the historic and modern images. Percentage representations of the change between each category in the historic and modern images. Discussion of landscape change in the images. Each of the image pairs selected for in-depth analysis as well as other modern and historic images from the stations around the Mt. Robson area can be examined with landscape change in mind. Is change evident across all vegetation and land use categories in an analyzed image pair? Is change evident in just a few categories, in only one or perhaps none? Do any of the image pairs suggest any factors that might be responsible for the observed change (e.g. climate change, industrial use, settlement, infrastructure, fire, etc.? Do any of the images point to implications for management within/without the Park area? Do the images highlight or point out an area where local knowledge can be used to add context to observed phenomena (e.g. land use/management issues, indigenous use of the land, historical events, etc. )?